There have been more than 35,000 goings down of the sun since Armistice Day, 1918. We have remembered them at the Cenotaph almost every year since 1919. It dipped a bit during World War II, perhaps understandably, when it became apparent that we hadn’t really fought the war to end all wars. 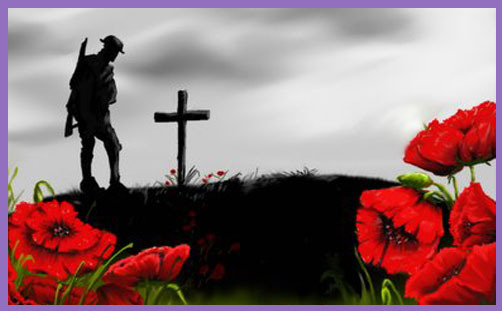 It’s hard to remember the poppies on Flanders fields when you’re battling for Britain and sailing to Dunkirk. But the more we say we remember them, the more we seem to forget. Remember.. Forget..
We can no longer rely on our political leaders to pay their respects to those who gave their lives so that those same politicians could stand in free and fair elections. They gaze at rows of crosses and argue about whether to wear a white poppy this year: political pacifism is deaf to the echoes of guns and bombs that killed our finest and bravest. They died that we might be free: free from tyranny and oppression, and free to determine our own future. Why do we say we will remember them when we chuck serving officers out of pubs; advise members of the Armed Forces not to wear their uniforms in public; and allow the enemy within our universities to ban real freedom fighters because it’s important “to avoid taking sides in conflicts”? Remember.. Forget.. They are all dead. They don’t see any more goings down of the sun or mornings. Every life that was loved is just dust. Flanders fields.. Normandy beaches.. Port Said.. Goose Green.. Belfast.. Basra.. Helmand.. etc., etc., etc. Life isn’t really much to lose when you’re old, but it’s an awful lot when you’re young. We don’t send the old to war: we send the young so that the rest of us can grow old, and then we can build our marble monuments and write our paper memorials to remember the glorious young dead with honour and solemnity, religiously, every year. And then the politicians come along and remove those monuments and re-write those memorials because.. well, times change and we must move on. If not this generation, it’ll be the next. Or maybe the one after that. Old enemies become friends, and old friends become enemies. Memories must be erased because good is re-evaluated and evil is turned to dusty myths. Would we remember the 1,300 who died in Isandlwana if it weren’t for Zulu? Have you seen Zulu? We don’t really remember them. They don’t want kisses and cuddles any more. Their medals are sold at auction and placed in glass cases to be gawped at. Bronze trinkets for forgotten valour. There is no one to remember them at the going down of the sun or in the morning. Their sacrifice is lost. Who knows? Who cares if it was even worth making? But God does not forget. He remembers everyone who ever died that we might live, and He knows them all by name. Our wars and tears and times of desolation will pass away, but the spirits of the fallen will sing their songs of glory throughout eternity. Our glorious dead. He will remember them even when we don’t.